"If you stay, you'll be here for many weeks, cut off from the outside. Like a caterpillar in a cocoon, walled in. Doors, windows shut so no light can enter. Your souls and minds must be sealed off too, until you are born again, the day of your rebirth." 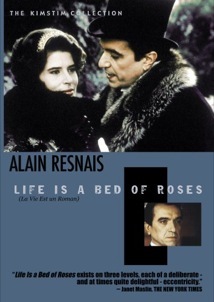 The English title is Life is a Bed of Roses. In the original French, it's known as La vie est un roman�life is a novel, a roughly equivalent idiom. According to the director, revered French filmmaker Alain Resnais (Hiroshima mon amour), the title is ironic, and the film argues that life is not a bed of roses. If you can watch the movie and figure out the crucial difference, you're one up on me, because I have no idea. Resnais, working with screenwriter Jean Greault, has created a film so stylized and artificial, it nearly collapses under the weight of its own oddity. In interviews the director has said he wanted to make a movie that was a departure from the conventions of cinema, but, most importantly, a comedy. One out of two. The film is separated into three sections. In the first, set shortly before and after World War I, a wealthy Frenchman, Count Forbeck, presents his fellow well-to-doers with plans to construct an elaborate palace he calls "The Temple of Happiness." The war interrupts the project, but enough of it is finished that, a few years later, he gathers his friends to conduct a grand social experiment, during with they will be isolated, dressed in garish gold robes, and drugged, their minds reduced to those of newborns. A rebirth, he feels, is necessary to heal the wounds of the war and the strife and discord of human existence (or he might just be upset that one of his guests, his one-time fianc�e (played by the ravishing Fanny Ardant) is there with another man). In the second portion, the setting is the same, but the temple is now some sort of alternative school, where adults stage endless symposia on the proper method for instructing children to be free and modern thinkers. One of the guests is Elisabeth Rousseau (Sabine Azema), an innocent schoolteacher who finds the intellectuals intimidating and sings about how the man she'll fall in love with is more than just a bar of soap. Did I mention that characters often break out into warbly song, for no apparent reason? Another guest, brash American Nora Winkle (Geraldine Chaplin) makes a bet that she'll be able to engineer a love affair between Rousseau and another guest, while she herself woos the slick architect Guarini (Vittorio Gassman), who wears leather, drives a motorcycle, and thinks the temple looks like a giant pastry, which it totally does. The third section of the film is some sort of operatic fantasy that takes place in the temple, and features an orphan prince, and evil ruler, and a guy in a lion outfit. There's some indication it relates to the games a few of the students in the second storyline are glimpsed playing, but it doesn't seem to fit very well thematically, except maybe to illustrate the point that the kids are each creating their own games of amusement. And that's the problem with the movie, which is obviously highly amused with itself at our expense. Whatever Resnais and Gruault intended, it collapses under the weight of one or a dozen too many stylistic flourishes. Rather than commenting on one another, the three separate storylines are their own bizarre animals, each seeming to make entirely unrelated points�about the fallacy of idealism, about adults in arrested development�in entirely different ways, none of them with much success. The social experiment is staged and shot like a lost episode of Star Trek crossed with a Hammer horror film, with performances as florid as the elaborate, artificial sets. The modern day portion has a realistic look but a farcical plot and characters that act downright goofy. And the fantasy sequence, well... I did enjoy that ridiculous lion outfit, and I didn't mention the midgets with springs attached to their heads. Which is probably a mistake, as, for all I know, they're just as important as anything else. Image Transfer Review: Not a great image by any stretch, though I can't imagine the source print was in great shape. What we have is a watchable but often flawed picture. For the most part, static shots and close-ups of faces look decent, with limited but acceptable shadow detail. But throughout, the disc offers grainy, somewhat dingy images, and while some of this is undoubtedly native to the film, it results in some artfiacting, particularly in shots of trees or other detailed backgrounds. There's also an odd jitter effect throughout, where the image appears to stretch up and down or side to side. Audio Transfer Review: The audio mix is simple but acceptable, with a clear presentation of speech and the score. Extras Review: Director Alain Resnais gets the chance to explain his film in the vintage documentary Resnais est un roman (29m:18s). Presumably produced for French television around the time the film was released, it features the director ruminating about the themes and stylistic flourishes of his film over rather grainy behind-the-scenes footage. He explains that he wanted to have characters sing here and there because music "says" more�creates more of a connection to the viewer than pages of dialogue could say. As the songs seem somewhat arbitrary, I'd disagree, but then, he admits "I don't know if it works, but that's my basic intention." He also talks about major themes, and how he tried to integrate them while still making an entertaining film, and spends a lot of time ruminating on human nature and society in general, in terms that don't necessarily relate to the film. Here and there are brief snippets with the set designer, the actors, and other technical crew members, explaining their contribution to the feature and narrating the plot for us. It's an informative piece, and worth watching if the film leaves you stumped. There's also a trailer. All of the features are presented with optional English subtitles. More an ambitious jumble of ideas than a narrative feature, Life is a Bed of Roses has something to offer intellectually, but not a great deal of entertainment value. A weird mash-up of musical, fantasy, social commentary, and farce, it tackles a few interesting questions�the futility of idealism, the childishness of much adult interaction�but distracts with a lot of nonsense and artifice.